Location: Located on the N bank of the river Usk on the Old Dock Reach, lying immediately to the S of the roundabout junction of the A4042 with Dock Parade. The Old Town Dock officially opened on the 15th October 1842, and closed in 1929, being infilled in 1932. Constructed to designs by John Rennie the younger (1794-1874), the nationally important engineer, by Dike and Meyrick of Bristol, for the Monmouthshire Canal Company. The dock entrance lock was only the third of its type to have been built in S Wales, and is the earliest dock entrance lock to survive. Mid C19 dock lock revetment walls at mouth of former Old Town Dock. Approximately 170 metres in length by 22 metres wide. Constructed of massive blocks of Pennant sandstone ashlar with granite jamb stones at rebates for former dock gates, since removed. Evidence of twin dock gates. 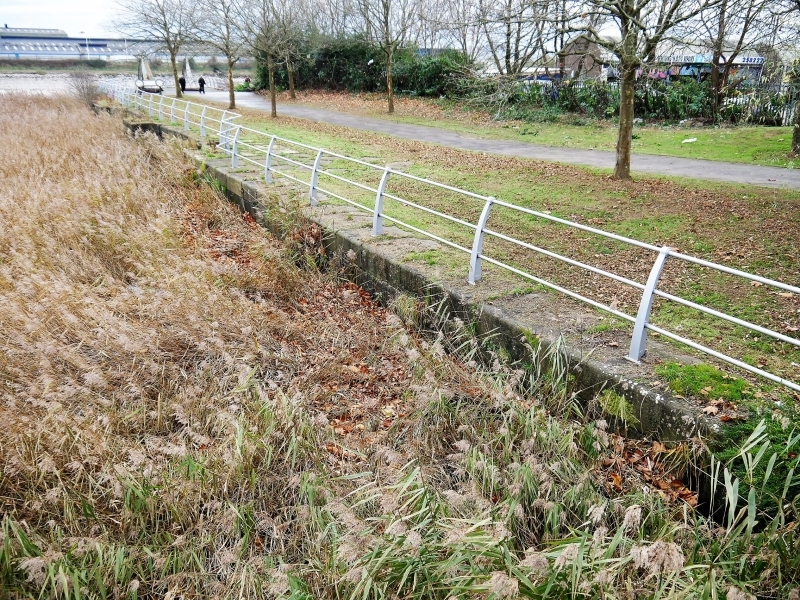 Some cast iron bollards survive to either side of dock wall, beneath modern infill material and vegetation. Listed grade II as an historically important fragment of the Old Town Dock, the oldest surviving example of a dock entrance lock in South Wales. Located on the S side of East Dock Road, on the East side of the Old Town Dock entrance. Prominently located on the East side of the A4042 roundabout. Located on W side of the A4042, close to junction with Dock Parade. Formerly on street known as Portland Street, now redeveloped. Located on the corner of Clarence Street and St Michael's Street. Prominently located at junction of Church Street, Mill Parade, Alexander Road and Commercial Road, opposite Public Convenience. Located at the junction of Courtybella Terrace, Mill Parade and Church Street, opposite the old Tredegar Dry Dock Offices at the S end of Commercial Road. Spans River Usk between Stephenson Street and Brunel Street.